Google Reader is a great tool for organizing all the blogs, sites, and content you subscribe to, but it’s not always the most visually stunning. It’s a list of endless posts from various blogs, and it can be overwhelming, especially when you have 1000+ items unread. That’s where Flipboard comes in! Flipboard is an app for iPad, iPhone, and iPod Touch that organizes your content from across the web in a visually pleasing way. This makes reading an experience rather than a chore. 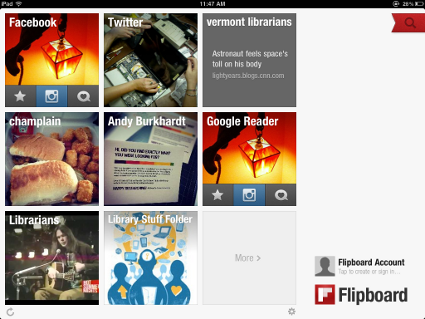 Instead of a list of posts, Flipboard is more akin to a magazine. It displays content in boxes with images, the title of the post, where it’s from, and the first few lines. That layout gives you enough info to tell if you want to spend time reading the post. And instead of scrolling endlessly down a page you flip through content like the pages of a book. It’s a natural motion and makes going through content much more fun. For the things you care about and want to stay current with, Flipboard allows you to add it all. You can add your entire Google Reader account and read it that way. You can also just choose a file within your Google Reader account to make your reading experience that much more tailored. 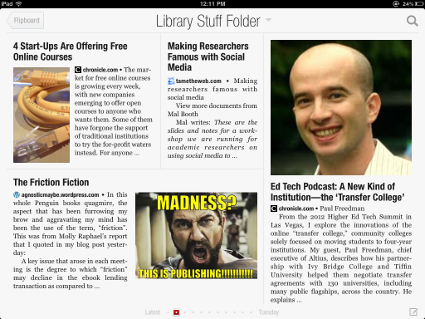 I have a folder of only my library blogs, so when I feel like catching up on professional reading I’ll go to Flipboard. There’s no way that I can read everything, so with this app I can just jump in the stream of content and not worry about missing something. I’ll read the few that are interesting and come back again later. It also let’s you add Twitter lists, people, or searches. I set it up for certain Twitter lists of people that consistently share good content. This makes it easy for me to read library related posts that I might not find elsewhere. In addition, it lets you add things like Facebook, Tumblr, LinkedIn, and Flickr. If you come across content that you really like, there are options to share it all from within the app. If you’re looking for a positive user experience and a new way to consume content that doesn’t leave you feeling overwhelmed, Flipboard is a great option. This guest post is by Andy Burkhardt, Emerging Technologies Librarian at Champlain College. His professional interests include technology, learning, social media, and new approaches to library problems. He writes about these on his award winning blog Information Tyrannosaur. His unprofessional interests include dinosaurs.